I have a bone to pick with a large percentage of men on dating apps. Using references to The Office in your dating profile is about as unoriginal and unfunny as a way of trying to pick up women gets. Now, don’t misunderstand me. The Office makes the list of my top 10 favourite things ever. A marvel of humour, it created and inspired a new genre of situational comedy in television. Thanks to it, we got other wonderful mockumentary-style shows like Parks and Recreation and Modern Family. I appreciate and love The Office for all that it is. I’ve only been on dating apps for a few months, and frankly—as one does—I have already gotten into the habit of deleting my accounts. I can only speak for my own experience in my search of a nice straight man (update: it hasn’t gone super well). I’ve been told by friends that this phenomenon exists among the dating profiles of all genders and sexual orientations—don’t worry, straight guys, this one isn’t all your fault. The trend couldn’t be ignored on Tinder, especially. 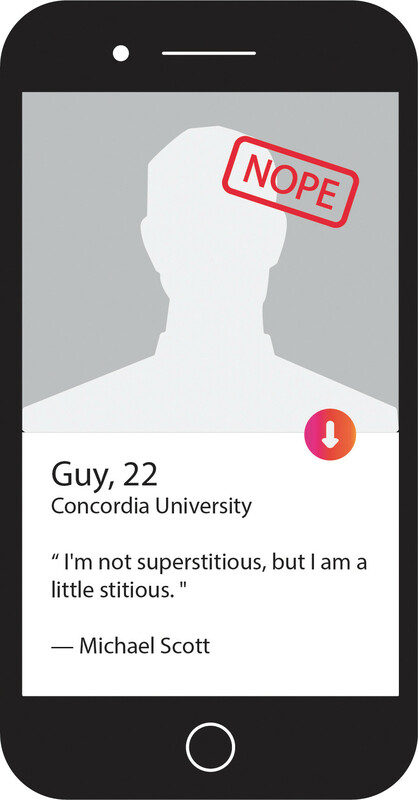 Whether it was a casual mention of binging habits, a not-so-subtle reference to a specific episode or joke from the show, or just an outright declaration of their obsession for it, I saw so many references to The Office on guys’ profiles that I started to wonder if it was some kind of unwritten rule that they must mention it. It’s not unlike the unwritten rule that they must include their height in their bios (or else girls might have to ask them once they’re already talking and getting to know each other!). All of this to say, I know that online dating isn’t easy. Guys, I know you think it’s easier for women than it is for you, and, honestly, that’s probably true to some degree, but believe me, that doesn’t mean we have it easy. In the past two months, I’ve been ghosted and unmatched by many. I’ve been berated on Facebook Messenger by a guy I unmatched who went to the trouble of finding me just to tell me how much of a bad person I am for doing so, and—I couldn’t make this up if I tried—showed up to a date to find an already drunk Irish man. He was exclusively drinking Guinness and Jameson, like a walking, talking meme. So, odds are you’re better than the competition. Just don’t use references to a show beloved by many as a crutch for your personality. Be original, and more importantly, be yourself. Mrs. Right is out there somewhere, and she’s just probably on a date with some loser and wishing she had never agreed to meet at a bar in his neighbourhood.